This book is about hunting. No, this book is about life—and eternity. This book is about how to get your son to heaven someday. Along the way, you want your boy to handle the sorrows of life without turning to crime, bitterness, or suicide. You deeply desire for him to have those life values, which, unlike materialistic values, will endure and make him a real man. Your hope is that he will grow up to be an unselfish husband to his wife, an example to his own children, and a generous contributor to his world, which is the subject matter of this book. Father and son combine their narratives here—stories and philosophies laced with cogent insights from God’s Word to bring you counsel that you will almost never read from today’s painfully failed and feminized social agenda magnates. Not every boy has a proclivity for the out-of-doors, for fishing and hunting. But every boy, regardless of interests, needs a dad who is a major participant, an encourager, and a counsel in his world—if that is the cyber world, orchestra, literature, or whatever—a dad who cares and gives himself to his child. Our world is the outdoor cosmos—room for all. So sit with us on the rim of Ngorongoro Crater as the sun sets in the west, silhouetting the acacia trees and a herd of contentedly grazing buffalo and experience the awe and grandeur of our God. Weep with us at the grave of departed canine friends. Laugh until you cannot right yourself at the mockery of nature and the quagmires in which men immerse themselves. And learn the love of a father for a son and a son for a father. Paige Patterson served as president of Southwestern Baptist Theological Seminary in Fort Worth, Texas, from 2003-2018. He is an avid hunter—he has taken three of the African “big five” (lion, leopards, and buffalo) and is a scuba diver. Patterson has spoken at Christian sportsman banquets throughout the United States, utilizing presentations about hunting dangerous game and emphasizing the critical importance of fathers in the role of building their sons from “the mischievous raw material of boys” into manhood. 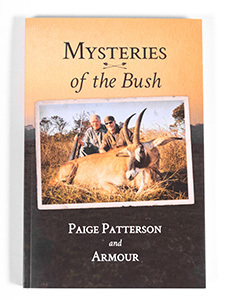 Armour has hunted and fished around the world for more than forty years, having never lost his boyhood fascination for all critters, the water, and the wild, silent places. He now lives in north Texas with his wife, Rachel, who shares his passion for the wild and also is good with a Winchester.